The nineteenth century abounds in cylinders. Locomotives and paper machines, gasholders and Yale locks, sanitation pipes and wires, rotary printing presses and steam rollers, silos and conveyor belts, kymographs and phonographs, panoramas and carousels, tin cans and top hats-each of these objects is based on the cylindrical form, and each could be-and some have been-the starting point for a comprehensive interpretation of the epoch's culture. To state it in the form of a necessary condition, without the cylinder the Industrial Revolution, and the culture it brought forth, would be unthinkable. How can we account sufficiently for this proliferation of cylindrical objects and processes? The answers given in the following pages are at the same time obvious and recondite, factual and metaphysical, technical and historical. In their most basic form, they amount to the proposition that cylinders allow the isolation, transmission, conversion, and application of rotational and translational (straight-line) motion in machines. The displacement of translational motion is necessary to do work; but since machines and mechanisms are (like their makers) finite, this motion has to be "returned." Translational motion has to be forced into reciprocating and rotational motion, while rotational motion has to be forced and anchored by straight guides and frames. The cylinder embodies both translational motion along its axis and rotational motion around its wall. Because every point on the cylinder's wall is equidistant from its central axis, the wall's surface is intrinsically flat and thus can impart the all-important motion of rolling. On these bare kinetic explanations rests a vast edifice of historical and metaphysical dimensions. Philosophical speculation in the West begins with the dispute about the reality of motion as the elemental distinction between being and nonbeing. The genealogy of the cylinder reveals the opposition of rotational and translational motion as one of the starkest conceptual oppositions in Western metaphysics, one that until the Scientific Revolution and beyond was tantamount to the distinction between divine and human, perfect and imperfect, rational and irrational qualities. This opposition-and the fact of its forced reconciliation in the cylinder-arises from an absence that for all its simplicity still is stunning: nothing on earth rotates. Nothing in our life-world turns continuously around its own axis, least of all parts of our own bodies. That is why rotational motion is always forced, technical motion, and that is why the question of technics on its most fundamental level equals the question of whether and how to force continuous rotation. It is the epochal achievement of nineteenth-century machines and their cylindrical components to have made rotation universally available, and at the same time to have brought to light the limits of technics: it begins where the body ends. The machines born in the nineteenth century are not sufficiently understood as tools, they are not monstrous "projections" of human organs into the world. Rather, they disrupt the imaginary continuity of nature and human being and introduce with their motions a literally "inhuman" element into the world. The negotiation of the limits between human and inhuman motion is going to be the subtext of most of the object descriptions that follow. Before exemplifying these propositions and looking more closely at the various cylinders that populate the nineteenth century we may do well to probe into the relations between rotation and translation, freedom and force, inhumanity and technics at the outset of the age of machines, and to set them in a historical frame that encompasses their theological, philosophical, and aesthetic dimensions. A singular and visionary text written at the inception of the cylinder's epoch will be our guide. In 1810, Heinrich von Kleist published an essay entitled "Über das Marionettentheater." It recounts an accidental conversation between the narrator and the primo ballerino of the local opera house, Herr C. When the narrator finds him watching the performance of a puppet theater in the public gardens, C. professes to be fascinated by the puppets' movements, and in the course of the conversation he outlines his idea that only a fully mechanized, unconscious body could be truly graceful. Both interlocutors go on to relate examples of the interference of consciousness with the grace of human motion, but it is Herr C. who most passionately advocates the elimination of all subjectivity from dance, going so far as to liken the goal of full mechanization with the return to paradise. The text appeared, in four installments, in Kleist's own Berliner Abendblätter, one of the early daily newspapers in Germany still printed on hand-operated presses that could perform only translational up-and-down movements and on paper produced sheet by rectangular sheet. While the slowness of this process was the reason for the slight volume of the paper-not more than six to eight pages per edition-the Prussian censors made sure that the content consisted mainly of trivial police reports, epigrams, and Kleist's seemingly innocuous anecdotes. There was to be no news that could foster unrest among the citizens, no opinion piece that would directly address the oppressed state of city and country. After the collapse of the Holy Roman Empire in 1806 and the subsequent trauma of French occupation, the governor of Berlin had justified strict censorship of the press with perhaps the most famous order in the German language: "Ruhe ist die erste Bürgerpflicht" (Rest is every citizen's first duty). "Über das Marionettentheater" is uniquely concerned with the state of unrest. It seeks to articulate in deliberately provocative ways the relationship between motion, subjectivity, and redemption. To propose an exhaustive account of motion without any regard to subjectivity and theology had of course been the goal of Newton's science of rational mechanics since the late seventeenth century; and a century later, Pierre Simon Laplace (for a brief time Napoleon's minister of the interior) had succeeded in purging Newton's theory of its last metaphysical remainders, such as the apparent irregularities of planetary orbits that required God's redressing hand. Newtonian mechanics described a world in which all causes of motion were external to bodies and in which every motion, every change in motion, could be expressed in mathematical equations. Translated back into the realm of human history and community, the key concepts of rational mechanics-inertia, resistance, mass, collision, equation, revolution-could take on disturbing political overtones. The cult of reason before and during the French Revolution had all but deified Newton and had made ample, cross-cultural references to his achievements. After all, the emblematic mechanism of the terreur, the guillotine, harnessed gravity to do rationally what had hitherto been reserved for the extravagant demonstration of a sovereign's wrath. It was not the least motivation of Friedrich Schiller's project of aesthetic education-conceived shortly after the guillotine's bloody reign-to exorcise the specter of such mechanical politics. Societies are composed of human bodies, Schiller insisted, and like all animal bodies they contain the principle of motion within themselves. What is more, human motion expresses a moral sense-sympathy-that mediates between the constrained mechanics of skeletomuscular motion and the unbounded freedom of the mind; it escapes all mathematical notations. The aesthetic effect of this moral mediation is gracefulness-the ineffable quality of human motion that represents in the world of moving bodies what beauty is for stationary objects. To move gracefully means to be in harmony with oneself, which in the gendered terms of Weimar Classicism meant to be a woman, or a man educated and graced by a woman. The outward representation of such harmony is dance. For Schiller, the remedy for a fractured and revolutionary society of colliding straight-line forces is the invitation to a dance in which individual and collective motions revolve around one another in a harmonious whole. The thrust of Kleist's text against this fusion of motion, subjectivity, and grace-against the core convictions of Weimar Classicism-must have been easily detectable for readers in 1810. Herr C.'s argument that inhuman marionettes exhibit more grace in their motions than human dancers, that, in fact, every instant of reflection prevents gracefulness, aims straight at the center of Schiller's (and Goethe's) attempt to bridge the chasm between body and mind, to install aesthetics above mechanics. At the same time, however, Herr C.'s quest for grace in motion reintroduces into natural philosophy the very theological parameters that Newton and the Newtonians had sought to eliminate. When the two interlocutors equate the loss of grace with the expulsion from paradise, they shift the attention from the moral to the anagogical sense of the concept. In its theological context, grace in motion-Grazie or Anmut-is the sign of paradisiacal wholeness, an embodied reminder of the innocence that was shattered irrevocably by the desire for knowledge. Weimar Classicism, cheerfully proclaiming its own paganism, held that paradise was just a mythological name for a historical formation, namely ancient Greece, that its loss was the result not of sin but of a history of decadence decisively shaped by the Christian Church, and that regaining paradise was, at least in principle, possible through a reawakening of the aesthetic sensibilities of antiquity, such as the moral feeling expressed in graceful motion. The notion of Bildung, so often evoked in the context of nineteenth-century German pedagogy, expressed this hope for an individual and secular recuperation of grace. Kleist's Herr C. explores a radically different avenue to the restitution of grace: rather than promoting aesthetic education, he speculates that the return to grace will come as the result of a complete dehumanization and mechanization of motion. This hope in the redemptive power of mechanical motion, then, was a broadside against Weimar Classicism, which, championed by Wilhelm von Humboldt and his Bildungs-reforms, had arrived in the Prussian capital just when Kleist published his short text. But the essay does more than polemicize, and what it does in addition is what makes it so interesting for our understanding of the future of mechanisms and their relations to culture and aesthetics in the nineteenth century-a future that is embodied in the cylinder and its kinematic properties. For unlike Romantic writers like E. T. A. Hoffmann or Mary Shelley, Kleist does not focus on the origin of motion or life in the puppets, nor does he marvel at their mimetic and illusory power. He does not mention the automata that delighted the eighteenth century before they began to haunt early nineteenth-century literature with their imitation of human consciousness and affectivity: he is solely interested in the spectacle of their motion. In the terms of nineteenth-century engineering, he focuses on marionettes neither as motors nor as tools but as transmissions. Discovering generalities in the transmission of motion is the purpose of nineteenth-century kinematics, a discipline as obscured by the awe of motors and the anxiety over mechanized tools as is the understanding of Kleist's text by the biography of its author and the speculations about its programmatic aim. The genealogy of kinematics as an independent discipline is the subject of the next chapter. It is true that the focus on kinematics in Kleist's text is hidden behind what seem to be traditional hermeneutic and moral concerns. When asked whether making marionettes dance requires artistry on the part of the puppeteer, Herr C. claims that there is a "center of gravity" in every motion and that the line traced by this center is identical with "the way of the soul of the dancer." To perfect the dance, then, the puppeteer-Kleist calls him "the machinist"-must place himself in the gravitational center of the marionette. This hermeneutic imperative of empathy is draped in mathematical language: the lines of motion, C. says, are either straight or of computable curvature, and the fingers of the puppeteer and the motion of the puppets are related "rather like numbers to their logarithms or the asymptote to the hyperbola." But this second-order grace is achieved by a sleight of hand. As Kleist-who once divided people into those who understand metaphors and those who understand formulas-knew very well, mathematical metaphors, conjoining algebraic precision and the vagueness of the "rather like" (etwa wie), are inherently contradictory. As failed metaphors-catachreses-such figures of speech at the same time open and attempt to cover over a conceptual gap. In Herr C.'s case, this gap appears earlier in his statement that every motion has a gravitational center. Within the basic parameters of Newtonian physics, only individual bodies, not motions, have a center of gravity: it is the imaginary, nonextended point in which, for the purpose of calculation, all of a body's mass is concentrated. The mathematization of motion in Newton's rational mechanics-and with it the possibility of attributing grace to unforced motion-is based on the assumption that bodies can at the same time be treated as nonextended points that trace out curves in the Cartesian coordinate system and as massive atoms that are subject to the law of inertia. This latter law-Newton's first law of motion-guarantees the continuity of motion; the geometrical inscription, on the other hand, allows for the calculation of its form. "Gravitational center of motion," then, is the catachresis that reopens what historians of science call Newton's great synthesis-his ability to treat discrete, massive bodies like continuous geometric shapes. In its attempt to cover up, the phrase brings attention to the abyss underneath the signal achievement of rational mechanics, the law of universal gravitation, by means of which the motion of physical entities is inscribed into the reversible and predictable grid of geometry. Any endeavor to attack Newton's mechanics frontally would be quixotic, given its explanatory success and its consolidation and empirical verification throughout the eighteenth and the early nineteenth centuries. But the bulk of that success-for example, the prediction of the return of Halley's comet in 1758-was based on the motion of bodies so distant in a space so vast that indeed they could be treated as imaginary point masses. But what explanatory and predictive power do the laws of motion have for bodies moving close at hand-for bodies that can exhibit grace to human eyes? There is, of course, the anecdote of the falling apple at Woolsthorpe that the Newtonians kept reciting to underscore the universality of gravitation; but aside from ballistics experts, who would routinely experience the free fall of objects, let only find their translational motion graceful? What can Newton's laws say about objects that do not simply fall but move nonetheless, such as wagon wheels, water pumps, pendulum clocks? This is the point of Herr C.'s fascination with, and critique of, marionettes. In a double sense he interprets them as pendulums: first, because the puppet follows the hand of the "machinist" with the lag of a string pendulum such that the straight-line motion of the hand is translated into the lagging curve of the logarithmic or hyperbolic function; second, because the limbs of each individual puppet, "which are only pendulums," are not tied to "myriads" of strings and therefore follow the "gravitational center of the motion" in the puppet with a hesitation that inevitably results in "curves." For marionettes as pendulums, the law of gravity is literally suspended-they are "antigrav," as Kleist says-but the law of inertial motion persists. That persistence, and the lag that results from it, is precisely the reason for the marionette's imperfection: it grants an abode for the "last fraction of human volition"-later in the essay it is called "affectation" (Ziererei)-that threatens to interrupt the grace of motion. The only way to overcome this danger is to eliminate the effects of inertia as well, and that is exactly what Herr C. hopes for: "Yet he did believe this last fraction of human volition could be removed from the marionettes and their dance transferred entirely to the realm of mechanical forces, even produced ... by turning a crank." The instantaneous transmission of motion by a crank suspends the effects of gravitational and inertial forces; it is the-often overlooked-ideal in Kleist's anecdote. Herr C. believes that perfect grace can be embodied, not in marionettes, but in crank-driven mechanisms. From the pendulum to the crank: it is hard to exaggerate the significance of this transition. Both are material objects built for a specific use, but both are also, in Hans-Joerg Rheinberger's felicitous terminology, "epistemic things": they embody ways of knowing and doing that exceed their functionality and historical employment. Residing below the threshold of fully articulated theories, they can serve-as Herr C. shows with the pendulous marionette-as their material critique and challenge. The pendulum, beginning at the latest with Galileo's (mistaken) assumption that its period is isochronous and can therefore be used to translate space into time, has both spurred and defied the development of modern physics and mechanics. Cranks, from an epistemic point of view, are the answer to the weaknesses of the pendulum: they seek to overcome the inertial lag inherent in pendulums through direct, continuous contact. This means that their motions are defined, no longer by the forces governing Newtonian mechanics, but by their own shape. In the following pages we will see that the rudimentary shape governing the construction of all motion transmission, including the crank, is the cylinder. The pendulum is a passive instrument, but the crank drives a transmission. Hoping for a transition from one to the other, as Herr C. does, and discovering grace in fully contiguous motion, signals the advent of a new understanding and appreciation of machines. Yet it is not only from the theoretical heights of such concepts as "epistemic things" that the transition from pendulums to cranks gains relevance. To the contrary, at the time of Kleist's writing this transition had become the crucial factor in the very real process of industrialization that was beginning to take hold in England. As we will see in greater detail in the next chapter, James Watt's decisive innovation in the design of steam engines concerned the manner in which the steam cylinder was connected to the working beam. Before his patent for the ingenious "parallel-motion" transmission, this connection consisted of chains or ropes-steam engines were, in essence, gigantic pendulums and were therefore limited to do lifting and pumping work. Watt's transmission, which used the connecting rod as a crank, freed steam engines from this limitation and thereby turned them into the universal engine of industrialization. These new mechanisms, and with them the new era of motion control, would have been all the more desirable for someone living in Berlin in 1810: with his imposition of the Continental System in 1806, Napoleon had cut off the Continent from British imports and technical knowledge. The expression of a desire for a crank-driven mechanism also carried a distinct-and in Kleist's case certainly not unwelcome-whiff of anti-Napoleonic polemics. Another dimension to Kleist's anecdote further connects the motion of the marionettes to the motion of machines and to the massive metaphysical and cultural shift they will bring about. While Herr C. concentrates on the two dimensions in which the puppets transform the linear impulse of inertial motion into the pendular "curves" of the limbs, the narrator notes that part of the naturalness in the puppets' dance stems from the way they dance "a round dance" (die Ronde). "A group of four peasants doing a round dance to a rapid beat could not have been more prettily painted by Teniers." The ronde-the Reigen, whose motion Arthur Schnitzler would famously use as a narrative figure in his eponymous novella-is a dance that represents not so much curvilinear as rotational motion. Facing and holding each other's hands, the dancers rotate around a common center; they experience, and by the grip of their hands counter, the centrifugal forces that Newton identified as "real" indicators of the immutability and absoluteness of space. The rich cultural significance of this type of dancing can be gleaned from the scene in Goethe's Werther where the protagonist falls in love with Lotte while waltzing with her-the waltz, like the ronde, consists in a rotational figure the axis of which intersects the gaze of the dancers while their bodies form a virtual cylindrical space around them. We will encounter multiple avatars of this motion in nineteenth-century artifacts; what is important at the moment is the difference between circular or curvilinear motion-which Newton's mathematical success in calculating the orbits of planets and comets had explained as the sum of two compounding translational motions-and rotation, which is a genuine motion without translational displacement. This difference, as chapter 3 will show, is at the heart of Western valuations of motion, in which rotation has traditionally been associated with transcendence and divinity. The difference between a pendulum arrangement-like Newton's bucket, like the marionette-and a rigid linkage like a crank to induce rotation will become crucially important in nineteenth-century machines (one of the favorite apparatuses of the time, the chairoplane, uses both). It is not simply a deconstructive metaphor to claim that Kleist's text itself resembles a machine that provokes and produces its own interpretations. Its composition, its logical and performative contradictions, even its mode of publication generate so much friction that attentive readers, like attentive engineers, try to supply argumentative lubrication to make the text and its arguments run more smoothly. The present account of the techno-historical subtext of the dialogue by no means seeks to invalidate or replace other attempts, nor does it claim to cover all or even most of the text's many facets. There are other aspects, however, that attention to the history of kinematics can also elucidate. The first is the convincing reading of the essay's arguments as a long poetological metaphor, in which Herr C.'s mechanized dancers function as the vehicle for the idea that bare, linear language could be converted into "round," troped language and vice versa, and that this could be done without the imponderable intercession of an author's intention. In fact, Kleist's linguistic companion piece to the "Marionettentheater," the equally performative treatise "On the Gradual Production of Thoughts Whilst Speaking" (Über die allmähliche Verfertigung der Gedanken beim Reden), advocates the same transition from pendulum to rigid linkage for the basic relation between language and mind. "Language then is not a rope, a brake on the wheel of the mind, but rather a second wheel rotating along parallel on the same axis." (Die Sprache ist alsdann keine Fessel, etwa wie ein Hemmschuh an dem Rade des Geistes, sondern wie ein zweites, mit ihm parallel fortlaufendes, Rad an einer Achse.) German literary aesthetics at the time was fascinated with the prospect of mechanical transmission between poetic registers or "tones"; the idea that the difference between the genres, or the laws of prosody, or the sequence of a plot could somehow be calculated and reproduced mechanically held wide currency at the end of the eighteenth and the beginning of the nineteenth century. At the end of this book we will encounter a less metaphorical attempt by Kleist to explain his vision of tragedy by means of a primitive machine; suffice it at the moment to underscore that the analogy between the movement of machines and mechanisms and that of poetic language is itself a standard trope of literary practice and criticism of Kleist's time. The reason why this analogy could grip the thought of such a diverse group of writers and philosophers-this is the second aspect brought into relief through the history of kinematics-is its importance for theology, or rather for the philosophy of history that emerged as its secularized translation at the beginning of the nineteenth century. Common to both religious and secular thinkers was the idea that the language of paradise-or that of ancient Greece, for the "pagans"-had no need for the distinction between prose and poetry, between the linear language of propositions and the metaphor that always contains a moment of self-reflection, of turning round on itself in the act of establishing a relation. Edenic language in its undisturbed form was a language not of communication, where the intention of the author is always under the threat of dissipation and misunderstanding, but of simple naming: word and referent were indissolubly merged in one unit. This unity was torn asunder by the desire for propositional knowledge, theologically known as original sin. Poetic language, then, is both a mournful sign of lost unity and an expression of the desire to regain it. If a way could be found to heal the rift between prose and poetry, and if that process could be advanced and perfected by mechanical, that is, faultless, rather than inspirational means, humankind could indeed, as Herr C. and his interlocutor speculate, return to paradise through the backdoor. This anagogical tendency of Kleist's text, well within the boundaries of idealist philosophies of art at the time, has a mechanical corollary that is important for any understanding of the age of machines. For the other consequence of the expulsion from paradise was the condemnation of the offended God: "Cursed is the ground because of you, in toil you shall eat of it all the days of your life" (Gen. 3:17). Work thus became the indelible sign of God's curse, a curse that-according to Christian theologians-could be lifted once and for all only by the apocalyptic destruction of the world. In the meantime, however, anything that helped to alleviate the weight of toil played a role in the drama of salvation. Therein lay the eschatological potential of machines that provided the background for even the most technical discussion of linkages and transmissions. This potential was radically ambivalent, as were the debates it would provoke: either machines were seen as the means of breaking the sanctions of work and mortality that characterized all human life after the Fall, or they were hailed as the tools of emancipation with which human ingenuity managed to mitigate, and perhaps overcome, the curse of work. These positions were not necessarily articulated in theological terms-the ecological criticism of machines that started early in the nineteenth century substituted the integrity of nature (and later that of Being) for the will of God, and the awe of machines and engineering was certainly not anti-Christian-but they were part of a deeper reflection that accompanied the rise of machines. The provocative point Herr C. makes-that we will have regained grace, and with it admission to the Garden of Eden, to the fullness of life and language once we have installed machines that counter the trajectory of falling things-stands at the beginning of this history of interpretation. Kleist's text, then, links the most mundane questions of motion transmission to the last questions of biblical hermeneutics. In the scenes between Herr C. and the narrator, it enacts a dialogue about the meaning of mechanisms, specifically about the relation between the induction of motion and salvation. In hermeneutic terms, this is the relation between the literal and the anagogical meaning of a term. Medieval interpreters of the Bible had simplified the multiple senses of the Scripture-they, too, were a result of the fall from grace-into four categories: literal, allegorical, moral, and anagogical. The classical example is Jerusalem. On the literal level, it is the historical city, on an allegorical level the church, on a moral level the soul of the believer, and on an anagogical level the heavenly city of salvation. Kleist directly conjoins the literal and the anagogical sense of the marionette while disregarding its allegorical value-the puppet does not signify anything else than itself, whereas in Schiller's and Kant's aesthetics it signifies heteronomy and absence of feeling-and disdaining the moral dimension, which he belittles as "affectation." For the formulation of the literal sense, Kleist invokes, as we have seen, the mathematical language Newton had proposed to purge science from the three spiritual senses; in his anagogical questioning he envisions a reopening of the gates of paradise through the elimination of the literal, physical fall, the effects of gravity and inertia. In the hermeneutic tradition, anagogy wants to know how and when the injustices of the world will be righted, and what clues Scripture, or the book of nature, furnishes us to understand where we are in the history of salvation. Traditional anagogical interpretation, then, has as its vanishing point the apocalypse. Kleist's anagogy imagines a return to paradise without prior judgment and without prior destruction of the world. This vision of the anagogical role of machines motivated, as mentioned, a great deal of advocacy for and activism against machines in the nineteenth century, whether explicitly or not. It was accentuated by the new physics of thermodynamics, and in particular by the law of entropy: rather than a day of wrath visited on the world from the outside, apocalypse in the nineteenth century became a predictable, inevitable feature of the world conceived as a finite configuration of energy. Machines could either be seen as accelerating this end-if the focus was on the consumption and pollution of their motor-or as slowing it-if the focus was on the optimization of energy/motion transmission. The latter was the position taken by kinematicists, as the next chapter will show, and was behind their secret conviction that kinematics and its associated practices (like the emergent science of lubrication) had a key role to play in nineteenth-century culture. The anagogical horizon of thermodynamics, of course, was not yet circumscribed at the time of Kleist, but the differentiation of machines into multiple senses was well under way. Already at the end of the eighteenth century, when the success of the steam engine had prompted further reflections on the nature and history of machines, French scientists had begun to discuss and institutionalize the analysis of machines in terms of their motor, transmission, and tool functions. It was in this division that kinematics as the science of transmissions was first named and defined. While there are problems with this view-Where, for example, is the tool of a locomotive?-it survived as a heuristic approach throughout the century. It is tempting to speculate whether it was consciously modeled after the hermeneutics of Scripture, with the motor representing the literal engagement of the machine with the world, the transmission the allegorical transport of motion, and the tool the moral interaction of machine and man. Much less speculative is the assumption that cultural, social, and literary criticism of machines has focused almost exclusively on the first and last of these "senses." Motor criticism, so to speak, is concerned with the unnaturalness and danger of thermally produced power, with its outsized dimensions, and with its ecological consequences. A great deal of late Romantic affect against machines and industry, in Wordsworth, Raabe, or Baudelaire, is fueled by this thought. Tool criticism, as it were, is mostly concerned with the degradation of work, with the displacement of the hand from direct contact with the object of work, and with the social deformations ensuing from the factory system. Disraeli's novel Sybil comes to mind, or William Morris and the Arts and Crafts movement, but mostly, of course, Karl Marx, to whom later chapters will return. Within this horizon, the concentration in the following pages on transmissions and their discourse, kinematics, seeks to fill a gap. The intention is certainly not to disregard other discourses on machines but to insist that there is an irreducible "transmissive" sense of speaking about machines and that this sense has been obscured by the disproportionate attention paid to motors and tools. Since in transmissions motion is transferred by contiguous contact, kinematics focuses on the form of machine parts and on the motions they can absorb and produce. Given their mutual constraint, these machine parts are bound by a synchronous, "analog" logic that radiates out both to the motor and to the tool and limits their form; but there is also a history of these forms that has rarely been told and that leaves an imprint not only on the machines but also on the objects they produce and on the culture in which they move. The titular result of this history is the epochal importance of the cylindrical form for a full comprehension of the nineteenth century. In keeping with the superimposition of the parts of the machines and the senses of interpretation, the attention to transmissions could be said to explicate the allegorical sense of machines. It is certainly true that in a "literal" sense the transmission is the allegorical part of the machine-it is nothing for itself, it is designed to make motion "other," it refers from one part (the motor) to another (the tool), and so forth. We will encounter this literalization of allegories and metaphors throughout the following pages; revolution, translation, horizon, freedom all have very literal, three-dimensional meanings in kinematics. Another egregious example is the notion of Gestell, which in Franz Reuleaux's kinematics denotes the one member in a linkage that is fixated so that the others can move. We now know that Martin Heidegger read Reuleaux in preparation for his essay "The Question of Technology," which launched Gestell into conceptual orbit. Allegories are, in the tradition of rhetoric, extended metaphors. The late German philosopher Hans Blumenberg-perhaps Heidegger's worthiest and most powerful opponent-published his Paradigms for a Metaphorology in 1960 partly as a counterproject to Heidegger's incessant reliance on etymologies and to the obscurity of his concepts. His principal claim is that some metaphors, rather than supplementing or adorning concepts, are originary (Blumenberg calls them "absolute") and only later become hardened into the currency of concepts. The use of such metaphors can only be exemplified but not theorized (hence the title Paradigms); it is born from the initial speechlessness with which human beings confront the world. For Blumenberg, the usage and conceptualization of metaphors is an instance of technologizing (Technisierung) that helps reduce the complexity of the world to manageable and predictable features and that is later forgotten as such. In this view, metaphors and their extensions, allegories, are linguistic machines that help negotiate the anthropological mismatch between world and words. Since Blumenberg conceived of his writings on metaphorology as a technological history of the mind, it is only fitting that from his papers the volume Geistesgeschichte der Technik (Intellectual History of Technics), which seeks to open an avenue complementary to the project of metaphorology, was just published. In these brief and suggestive essays, Blumenberg sketches out a history that pairs notions and practices in technics with their philosophical and theological counterparts, thus bringing them into a new state of oscillation and radiance. In his short histories, notions such as "invention," "law," "fall," "acceleration," and "imitation" are charged with a semantic energy that exceeds their use in either metaphysics or technics. The following pages aim to expand on this project. The dimensions of hermeneutics, rhetoric, and theology implied in Kleist's text also help to situate the present project vis-à-vis the dominant discourse on nineteenth-century culture, the writings of Walter Benjamin and his innumerable followers. In his Arcades Project, the culmination of a long effort to unsettle the conventions of literary and cultural criticism, Benjamin read texts, artifacts, and practices of the nineteenth century like allegories, like words that refer to other words while their reference to worldly phenomena is obscured by ideological and theological forgetfulness. The purpose of this reading was to escape the hermeneutic ideology of the symbol for which every artifact is an expression of an ineffable individual and, increasingly throughout the nineteenth and early twentieth centuries, of a national spirit. Like Kleist, Benjamin saw in Schiller's celebration of such imponderables as "grace" and Bildung a stifling and potentially dangerous tendency to disable critical analysis in favor of affirmation and sentimental identification. To give an obvious example, calling a monument like the Eiffel Tower an allegory of industrial production rather than an expression of French spirit was a means of maintaining a critical distance to a cultural object and connecting it to other objects and phenomena (bridges, clocks, lighthouses) that it could in turn illuminate. Modern, commodity-producing societies, according to Benjamin's underlying argument, forget and indeed repress the allegorical function of their products in favor of the fetish of their originality and independence. Benjamin brought this insight to bear on the mode of his writing: the Arcades Projects, as much as we can determine from the methodological reflections it contains, was an attempt to reconstruct a network of cross-references that would convince readers, by sheer force of evidence, of the repressed inner coherence of industrial, social, cultural, and political production. Like Aby Warburg's contemporary Mnemosyne project, Das Passagen-Werk was to be an atlas of quotations that would reveal the allegorical fabric of the epoch. But Benjamin was not content just to reconstruct the kinematics of signification in the archives of the nineteenth century in Paris and Berlin. As we know from the very same theoretical reflections, as well as from his later essayistic and biographical writings, he experienced incessant translation, where every word and every object means something else and obeys only the parameters of communicative or transmissive functionality, as a deficient, fallen mode of signification compared to an ideal, paradisiacal state where every thing was in its place and every word, like a name, meant just itself. While Kleist at the beginning of the epoch of kinematics hoped for a return to paradise through the total elimination of (kinematic) freedoms, Benjamin at its end hoped for the messianic interruption of incessant translation. Although in his personal recollections Benjamin often expressed delight in the transitoriness of nineteenth-century phenomena-for example, in his childhood reflections on the large cylinder of the Kaiserpanorama-his "doctrinal" writings vibrate with disdain for the obliviousness and profanity of the epoch, for its aversion to the possibility of any messianic arrest of history. Unlike Herr C., Benjamin did not see any grace or hope in the motion of machines, nor did he expect redemption from mechanisms that could convert the translational motion of falling and alienation into the rotational motion of reflection and self-containment. That is why all of his key methodological terms-standstill, shock, rupture, epic theater, flash point-are antikinematic; unlike the dancer's crank, they all aim at interrupting rather than translating motion. Benjamin's anagogy, unlike Kleist's, requires the destruction of the world of machines. If the following pages adopt the perspective of the eccentric dancer rather than of Benjamin's messianism, it is not because of principled objections to its impetus but because issues such as apokatastasis (the most comprehensive rotation possible), justice, and salvation are just too vast for a modest book on mechanics and literary history. The restricted focus, and the empathetic admission that there may be a potential for grace in the products of mechanical engineering, allows for greater attention to details and to immanent developments, and it affords, hopefully, a more comprehensive view on phenomena that otherwise have seemed unrelated. In the resulting reassembly and rearrangement of disparate phenomena-in particular the integration of nineteenth-century narratives into the discussion of kinematics-and the use of multiple vocabularies to describe them I hope to convince the reader that there is a level of description that the prevailing literal, moral, and allegorical readings of nineteenth-century culture have not reached. It goes without saying that many of the phenomena here discussed have other than kinematic and literary dimensions; but, as both Kleist and Benjamin knew, the sphere in which to address such dimensions is not academic scholarship but political debate and action. The following chapters will unfold and demonstrate the centrality of the cylinder in subsequent steps. After a genealogy of kinematics, centered on the presentation of its greatest synthesizer, Franz Reuleaux, a brief overview of the metaphysics of motion that issues in the rise of the cylinder rounds out the first part. The second part is chiefly concerned with demonstrating and illustrating cylindrical devices, showing the cylinder in its role as motor, as tool, and as enclosure, and arguing for the importance of the screw as the machined conjunction of translational and rotational motion. Spliced into these technical descriptions are readings of the epoch's greatest literary innovation, the realist novel, with Charles Dickens, Honoré de Balzac, and Henry James as the focal points. An epilogue attempts to situate this intellectual history of technics in the terrain of current scholarship and provides an outlook on the destruction of the cylindrical paradigm in the twentieth century. A note on the photographs: with "literal" illustrations of these devices readily available on the Internet, a good portion of the images were selected to highlight the formal intricacies and inner relationship of the objects. These aspects became visible-heroically or nostalgically-only after the age of the cylinder had gone into crisis. Albert Renger-Patzsch in Germany and Margaret Bourke-White in the United States both seem to have been fascinated by the opacity and finality of the cylinder and the motions it embodied. With more patience (and a larger budget), the visual grammar of the cylinder could be traced on both sides of the Atlantic, with additional input from Soviet photography. The Cylinder investigates the surprising proliferation of cylindrical objects in the nineteenth century, such as steam engines, phonographs, panoramas, rotary printing presses, silos, safety locks, and many more. Examining this phenomenon through the lens of kinematics, the science of forcing motion, Helmut Müller-Sievers provides a new view of the history of mechanics and of the culture of the industrial revolution, including its literature, that focuses on the metaphysics and aesthetics of motion. 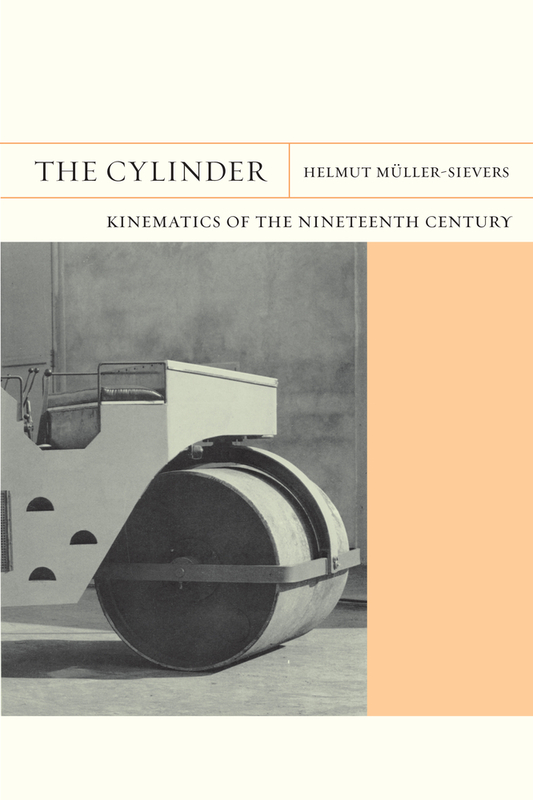 Müller-Sievers explores how nineteenth-century prose falls in with the specific rhythm of cylindrical machinery, re-imagines the curvature of cylindrical spaces, and conjoins narrative progress and reflection in a single stylistic motion. Illuminating the intersection of engineering, culture, and literature, he argues for a concept of culture that includes an epoch’s relation to the motion of its machines. Helmut Müller-Sievers is Director of the Center for Humanities and the Arts and Eaton Professor of Humanities and Arts at the University of Colorado at Boulder. His previous books include Self-Generation: Biology, Philosophy, and Literature around 1800.